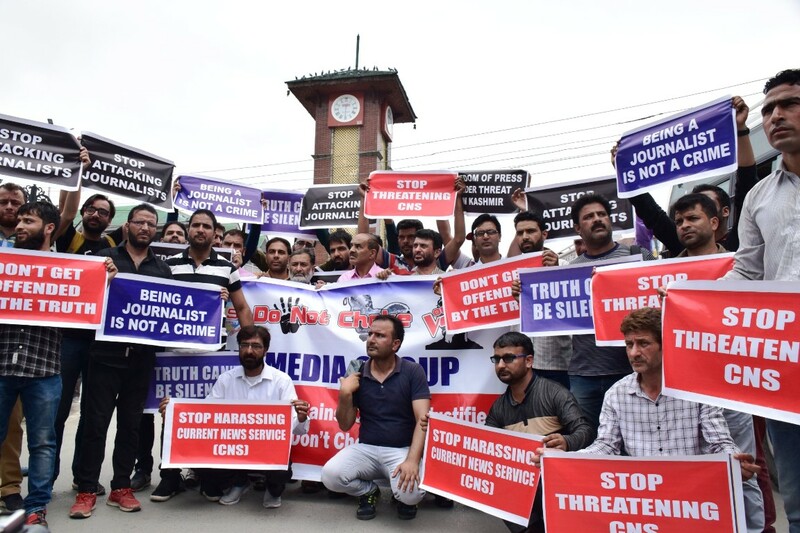 Journalists affiliated with news agency CNS particularly district reporters from across Jammu and Kashmir on Monday staged a peaceful protest both in Srinagar and Jammu against registration of an FIR for circulating the letter of scholar turned Hizb militant Manan Wani. The spokesman in a statement said that police station Kothi Bagh has lodged an FIR vide number 62/2017 against Current News Service for ‘providing space’ and circulating the article of Manan Wani terming his content as propaganda. In Kashmir capital Srinagar, a large number of scribes held a peaceful march that started from Press Enclave and culminated at Clock Tower Lal Chowk. The scribes were carrying banners and placards which read: ‘In democracy, we need free press,’ ‘Stop harassing journalists,’ Stop intimidating CNS,’ ‘Being a journalist is not a crime,’ etc. The protesting scribes’ appealed authorities to allow them to work freely and stop intimidating them. While talking to reporters, Editor-In-Chief CNS, Rasheed Rahi said that free press is the nerve center of a democratic set. He said the registration of FIR against journalists is a direct attack on the free press. “From past two decades, this news agency has been carrying the press releases of army, police, government departments, and militant outfits. It is for the first time that we were booked for carrying the letter of a militant. A journalist is living under the shadow of two guns in Kashmir. One is in the hands of government and militants are holding the other. How can we appease one and ignore others. We are neutral and have right to represent all sections of society,” he said adding that in recent past two FIR’s were registered against CNS. Rahi appealed Governor Administration to look into the matter and get the FIR’s revoked. He also appealed journalist fraternity to take measures and ask the government to stop registering cases against journalists. “Today police targeted us and tomorrow it may be someone else. We have to join hands and chalk out a strategy to stop intimidation from the authorities,” he said.